The story of Indian agriculture has been a spectacular one with a multi-functional success in generating employment, livelihood, food, nutritional and ecological security. The green revolution had heralded the first round of changes. Besides food grains, vegetables and horticulture products – the fruits, it ought to be appreciated that pulses are important component to sustain the agriculture production as the pulse crops also improve the overall soil fertility while making the soil more porous due to tap root system. Pulses are also important source of protein, fibre content and provide ample quantity of vitamins and minerals. Pulse plantation in intercropping farming systems and cultivating them as cover crops reduces the need for synthetic fertilizers and also reduces soil erosion. Healthy soils, are in turn, better able to retain moisture and facilitate the uptake of nutrients by plants. The reduced use of synthetic fertilizers indirectly reduces the level of greenhouse gases released in the atmosphere. Thus taking a holistic view on the importance of lentils, the United Nations rightly proclaimed 2016 as the International Year of Pulses. In fact, the world body’s decision is also guided by the fact that the UN wants to highlight the importance of pulses in curbing malnutrition. Moreover, the farm policy makers need to wake up to the reality that demands for pulses are rising even in areas in different parts of the world where pulses have not been a staple diet. In India, pulses have always received due importance both in terms of requirement by consumers and the adequate support from the government on the production front. India has largest share of about 25 per cent production, about 33 per cent acreage and about 27 per cent consumption of total pulses of the world. India is the largest producer of pulses and also the biggest consumer. But the domestic production is often less than the required quantity. Hence the shortfall is made up by imports. The estimated domestic demand is normally around 23-24 million tones. Due to a deficient monsoon, pulses production fell to 16.47 million tons in the 2015-16 crop year from 17.15 million tons in the previous year – 2014-15. 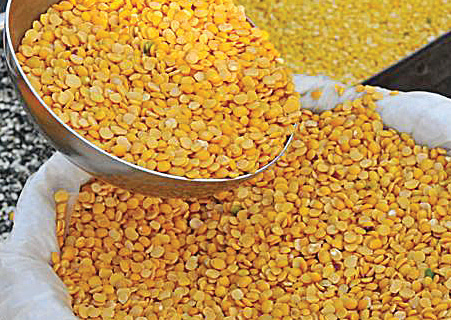 ‘Arhar’ accounts for about 15 percent of the total pulses production. Earlier this year, the shortfall in pulse production and other factors led to high prices of pulses often forcing the government to take a few drastic steps. However, the latest breakthrough in developing a new “short duration variety of Arhar Dal” developed by the Indian Agricultural Research Institute (IARI) is expected to be a game changer. On October 31, 2016, after Union Finance Minister Mr Arun Jaitley and Union Agriculture Minister Mr Radha Mohan Singh visited IARI, it has been announced that the new pulse variety, PUSA 16, is currently undergoing field trials in eight locations across the country. This variety matures in around 120 days against at least 160 to 180 days taken by other Arhar varieties. It was also announced that this variety of Arhar will be released commercially in the next kharif season 2017. Once it is put to commercial use, it will have great impact. According to scientist with IARI, this variety is likely to encourage farmers in Punjab, Haryana and western Uttar Pradesh to shift to pulses cultivation from water intensive paddy. Pusa Arhar 16 is undergoing field trial this Kharif season in Pusa campus (Delhi), Ludhiana (Punjab), Hisar (Haryana), Jaipur, Kota, Bikaner (Rajasthan), Medziphema (Nagaland) and Pantnagar (Uttarakhand). Normal arhar varieties are tall and take 160-180 days to mature, while yielding about 20 quintals of grain per hectare. According to reports, the plants of new dwarf Arhar variety are barely a metre tall and give the same 20 quintals/hectare yield while maturing in just 120 days. A single irrigation at most may be required at the pod formation stage. In normal arhar varieties, the flowers, moreover, do not set pods at the same time. It means that at the time of harvesting, not all pods are mature; some may have already shattered, and others are still developing or even at the flowering/vegetative bud stages. In the Pusa Arhar-16 variety, there is synchronous maturity with podding happening only at the top. So, the entire crop can be harvested in one go using combines, without the need for manual labourers for cutting and threshing. The new Arhar variety is a semi-erect compact plant type. The high yields result from high-density planting, with row-to-row distance of 30 cm and plant-to-plant spacing of 10 cm, whereas these are 75 cm and 30 cm respectively in traditional varieties. High-density planting is not possible in their case because the plants themselves are of indeterminate and spreading type. This new super Arhar would help in bridging the demand- supply gap. In order to enhance the availability of pulses, the central government in a major move decided to enhance buffer stock of pulses from 1.5 lakh tonnes to 8 lakh tonnes. Later, the decision was reviewed and the ministerial committee decided to increase the buffer stocks to whopping 20 lakh tons from the 8 lakh tons. The government also set up a committee headed by the Chief Economic Advisor, to consider reasonable increase in Minimum Support Price for pulses and bonus for the farmers for producing pulses. The centre also decided to provide additional pulses to the states at Rs.66 per kg for Tur and at Rs.82 per kg Urad for retail distribution. The government also approved to import of pulses from countries like Mozambique and Myanmar and in June a high-level team headed by the Food Secretary had visited Mozambique to explore avenues for imports from more pulse-growing nations on a government-to-government basis. The government has acted against hoarders and tried to ensure in coordination with states to ensure availability of pulses including Chana at reasonable prices. The Cabinet Committee on Economic Affairs (CCEA) at its meeting presided over by Prime Minister Mr Narendra Modi on June 1 decided to give a "bonus, over and above the recommendations of the Commission for Agricultural Costs and Prices (CACP)" of Rs 425 per quintal for kharif pulses -- for arhar (Tur), urad and moong dals (pulses) and also for oilseeds. Faced with demand-supply issues with pulses and oilseeds and to bring down dependence on imports, the government on June 1 sought exhorted farmers to target higher productivity of these commodities and hiked the Minimum Support Price (MSP) of kharif (summer) pulses and oilseeds. But the need for boosting pulse production is a well understood phenomenon for last several years. The Government of India had launched a number of schemes from time to time for area expansion and productivity enhancement. Under the 4th Five Year Plan, the government had taken up an ambitious project “Pulses Development scheme”. Subsequently, there were other initiatives in the past like Special Food Grain Production Programme and the Integrated Scheme of Oilseeds, Pulses, Oilpalm and Maize. At a later stage under National Food Security Mission, a special programme ‘Accelerated Pulses Production Programme’ was also launched some years back with an objective to demonstrate plant nutrient and plant protection centric improved technologies of pulse crops. This was chiefly aimed at boosting production of chickpea, blackgram and greengram. Now, besides this game changing efforts, under the ‘Prime Minister’s Krishi Sinchayi Yojana’ also pulse production has received adequate attention. Introduction of modern technology oriented Mobile Phones and Apps to provide information on prices and cultivation to farmers, benefits of using pulses are other initiatives. The government has been also taking steps by creating a buffer stock, imposing stock limits, and offering pulses at low cost through mobile vans. The government also took steps to encourage Foreign Direct Investment (FDI) in food processing. Having said these, it will be pertinent to examine how the present challenges in pulse availability and prices can be addressed. Agriculture watchers also lament that the current crisis is linked largely also to “decrease in farm area” for pulses as farmers generally opt for high-yielding crops with higher MSP, such as paddy and wheat. Pulses are thus often grown in marginal, poorly-irrigated and low-quality soils, resulting in lower yield. Moreover, the crop failure or lower yields of pulses in some parts of India is also due to the fact that pulses in India are mostly grown in rain-fed areas with unstable and uncertain rainfall conditions. Having discussed various pros and cons related to production of pulses, in the ultimate analysis, it would be prudent to talk about studies those reveal that only 8-10 million tonnes of pulses are used in India directly as a food item (Dal), while the rest of the production – about 12 million tonnes are actually consumed only indirectly that is to manufacture snacks and such fast food items for home consumption and export. With regard to pulses – or the Dal – as is commonly understood in India, the consumption of the same is also related to affordability yardstick. Some on field experiences and feedback from ground zero have led to observations that often poorer rural folks or slum dwellers find taking ‘boiled eggs’ a more practical proposition than eating pulses or Arhar Dal. This is because, eggs are much cheaper and also require less fuels unlike preparing a pot full of Dal. There is another issue, the per capita production of cereals has steadily increased in each decade from 145 kg during the 1970s to 158 kg during the 2000s. Between 2000-01 and 2013-14, India has been exporting 8.94 million tonnes of cereals per year on average. As things stand, all efforts have been made by the government to make the shortage of pulses and related high prices a thing of past. Indian farmers have also enthusiastically responded to government channelizing the actions and have shown greater interest towards sowing pulses lately including in summer crop season – the kharif. There are reports of agriculturists diverting large areas from soyabean to cultivation of Arhar and Urad. Such trends have been seen in Madhya Pradesh, Maharashtra and Rajasthan. In Rajasthan, farmers have also shown interest in Moong cultivation. Indications are that farmers in different parts of the country will equally show greater interest for sowing of Chana and Masur dal. The new Arhar sample – Pusa Arhar 16– is also expected to be a significant development and thus the pulse pinches may soon turn out to be a thing of past.